The major choices and decisions that I have made concerning the design and construction of this electrostatic loudspeaker were influenced by a lot of factors. The most important are not only technical, I have also put a great deal of effort in trying to integrate the speakers acoustically and aesthetically in the living room. I do not have a separate listening room, and as such a lot of compromises have to be taken. We live in our house in some form of multi-master mode, so the two adults and the three children have to accept and like the incorporation of the sound system. My starting requirements where clear: it must be electrostatics, an exception maybe for the lowest two octaves (below 100Hz), and they must be capable of reproducing at a loud level (100dBA). Electrostatics are large and even huge compared to other reproduction technologies, so the visual and aesthetic appearance, the integration in my home, etc were often conflicting with this. My previous speaker system was a pair of Janszen Z40 hybrids. You can see a picture of those (with cover removed) here. My experiences with those: very good speakers, considering the fact that they are so old. Some years ago I decided to replace them, but even when listening to speakers in a price level well above 3000 Euro, which is by far exceeding my budget for those things, I did not experience at all the pleasure that I had with those old boxes. So the route to self-building was taken. What I learned from these Z40's is first of all that the crossover frequency at 750Hz is far too high. In the self build project I would like or to go for a full-range ESL, or if this is not successful to place the crossover frequency as low as possible, preferably not higher then 100Hz. A second improvement that could be done to the dynamic subwoofer is to choose an enclosure that fits acoustically the best with the electrostatic part. I am convinced that in a lot of hybrid ESL designs the dynamic woofer is too dominant, partly because a too high crossover frequency is used, but also because of the choice for an inferior type of woofer cabinet. I have been reading a lot of the available literature on ESL theory and practice; see References. One thing became clear: also ESL technology has its drawbacks, and one of the major drawbacks is its insufficient bass response. Only when going to really large panels (1mÂ² for example) the air volume that can be displaced becomes (marginally) sufficient for powerful bass at the lowest octaves. SPL (sound pressure level) at bass frequencies that comes out of a transducer can readily be calculated, the only parameters to be known are the surface of the radiator, maximum travel of this radiator and enclosure type. A spreadsheet that can be found at Linkwitz dipole sound system) calculates this. This spreadsheet calculates SPL (sound pressure level) for a dipole point source on a baffle, but an ESL is a dipole piston source on a baffle. Therefore some adaptations in the formulas are necessary when using it for an ESL. This SPL spreadsheet is adapted such that it can be used for an ESL dipole transducer. When we start at a high enough frequency there is no cancellation at all. When the frequency lowers cancellation starts first to have effect on the outer area of the piston (ESL) but not yet on the point source, because the point source is for those frequencies (with a short wavelength) still too far away from the edges. So the piston SPL drops very slowly (this is also mentioned in Reference 1), the point source SPL does not drop yet. The drop for the piston will be less then 6dB/oct, because only a part of the radiating area is suffering from cancellation. When the frequency lowers more and more the area that suffers from cancellation increases towards the middle, and when the middle is reached (assume this is at frequency f1), only then the point source radiation will start to suffer from cancellation also. From this frequency on, both radiators have will have similar rate of drop versus frequency, but the piston radiator has already 'build up' some dB of attenuation. So the attenuation versus frequency for the piston ESL is a curve that follows the curve of the point source radiator, and is for all frequencies below f1 some dB lower. I have done measurements on some prototype ESL panels, compared the results with the curves in Reference 1, and with the calculations from the original Linkwitz spreadsheet. From this it was possible to extract that the constant difference between the curves for point source and piston radiator below the corner frequency f1 is around 6dB. This is introduced in the above spreadsheet. Another thing (related to the previously mentioned low bass output), that kept me busy for quite some time is the fact that an ESL is a dipole radiator, with all the consequences of that. A dipole radiator is maybe the best acoustic radiator when it comes to clarity of the sound, spaciousness, etc. This because the typical box-sound is absent. But a lot of the literature forgets to mention a serious drawback of a dipole radiator: Namely the fact that when it produces sound at frequencies where the wavelength becomes longer then the smallest dimension of the radiator, the output will start falling. For an ESL (the width is mostly much smaller then the height) it drops in fact at 6dB/oct below the frequency where the wavelength is equal to the width of the stators. The effect is disastrous for the lowest octaves. Assume an ESL, 30cm by 2m for example: at 1000Hz the wavelength is approx. 30cm, so the output drops at a rate of 6dB/oct below 1kHz. This means that around 60Hz we are already 24dB lower, at 30Hz 30dB lower! Only Reference 1 mentions this effect and gives explanations and possible cures for it; Reference 2 mentions the phase-cancellation only at one single position in the text: where the dipole dynamic woofer of a hybrid system is discussed. For all the discussed electrostatic dipole speakers the phase cancellation effect is completely 'forgotten'! Not a very serious and objective comparison - Also Reference 3 does not talk about it. I was very surprised about this fact, as an engineer I have enough theoretical background to realize that this effect (mostly called 'phase cancellation') must be there, as a basic physical law causes it. To evaluate this I have build first of all a prototype ESL, 30cm by 1.2m. The result was as expected: a thin sound, bass response really not convincing. I set up a measuring instrument to evaluate this more in detail, again based on information available at Linkwitz dipole sound system), under 'shaped tone burst generator'. This is a wonderful instrument set-up, for someone with some experience with electronics not too difficult to build. It allows me to do accurate acoustic response measurements, with very low cost components, and down to 20Hz. You need a simple oscilloscope to be able to interpret the measurement results. The beautiful thing: although the instrument looks old-fashioned, it does some things better then many modern PC-based instruments like for example a Clio instrument: for it makes possible to measure down to 20Hz even in a rather small room, with highly reflecting walls. This prototype ESL and the measurement set-up showed me clearly that phase cancellation as shown in reference 1 is really ruining the bass response. The measured response from my prototype was very similar in shape to what reference 1 shows in figure 4-1 at page 15. At 80Hz I was over 20dB lower then at 1kHz. This explains the thin sound. After incorporation of a simple active electronic correction filter for this I could make the response curve nearly flat between 1kHz and 100Hz. Without the correction filter the response was as said thin, but there was bass, ... only at very low frequencies. This is where the membrane is in resonance, and in my prototype this was around 35Hz. When the membrane is not damped well, I had a peak around 18dB above the level at 50 to 70hz. So the peak level at 35Hz was nearly equal to the level around 1kHz, but there was a serious dip between 80Hz and 500Hz. And this explains the thin sound with nevertheless some bass present. I must admit that the bass sounded nice, and I am not surprised that many people like the sound of an uncorrected ESL, despite the fact that the amplitude response in the lower end is honestly spoken very poor. But once a measurement done, one soon realizes that something (to name it: a deep gap between lower bass and low mid frequencies) is missing in an ESL that is not corrected for phase cancellation. With the correction filter to boost the level below 1kHz, the resonance peak at 35Hz is also boosted, so we need to incorporate a serious damping for the resonance. This can be done with some cloth around the ESL stators, and works well. But when doing this I realized that to get rid of the resonance you have to damp it such that the response level around 35Hz must continue to fall at the same rate (6dB/oct), as for higher frequencies. If you damp it less, you will have more bass of course, but you have this bass only because it is sustained by a resonant boost effect. This is clearly similar to a bass reflex, or band-pass cabinet, there also a resonance is used to lift the response at frequencies where the transducer loses efficiency. In my opinion the incorporation of a resonance boost in an ESL is not a good idea. I threw away a bass reflex enclosure first, a few years later a band-pass enclosure, all self-made with expensive drivers, because the resonance bass does not sound natural. I know that a dipole like an ESL is something completely different; as it is a dipole it does not show the typical box-sound. But the incorporation of a resonance in it is something I do not like at all. In fact I am quite astonished to notice that in the high-end audio market segment, a lot off people are willing to pay huge sums for a loudspeaker that can only (marginally) give enough bass response. And this last thing only thanks to the incorporation of a boosted bass response with Q-factor as high as 2 or 3! A dynamic speaker with such poor bass response would definitely not be accepted. Therefore the decision to leave the full-range-ESL-camp and join the hybrid-ESL-camp was taken. a full range ESL only has some bass response 'thanks to' the fundamental resonance that lets the membrane resonate at the lowest frequencies. If this resonance would be damped down to a Q-factor below 1 (and this is really needed for good transient response), the phase cancellation would lead to response curves at least 15 to 20dB down at the lowest octaves. This because there is not any single physical reason that would drive the response up at those lowest frequencies, except for a resonance. I have never seen, met, or discussed anyone that can give a clear, funded explanation that this is not true. Even the Quad ESL63 (which is dimensional a rather broad speaker, and this is better against phase cancellation) needs a resonance with a Q-factor of around 2.5 at 85Hz in order to get useful output at this frequency. This is described by Baxandall (see Reference 8 ), and is also clear when you look at the response curves. And 85Hz is still rather high for a full-range; at 30 or 40Hz the phase cancellation leads to more then an extra 6dB loss. a well designed (dipole) woofer with a quality driver of sufficient air displacement capabilities, has nearly perfect control on the sound output. In such a transducer it is possible to get a sound wave that is much better following the input signal, then with a resonating ESL membrane. We must realize that in the latter case at resonance only the frequency of the sound wave is controlled by the input signal; the phase and amplitude are not controlled any more! So we go for a hybrid design. I do not have a separate listening room, therefore the system has to be integrated in the existing living room, and some compromises will have to be taken. Some of the requirements and conflicting items can be summarized as follows. The weakest link in the ESL channel, namely the step up transformer should ideally be absent. 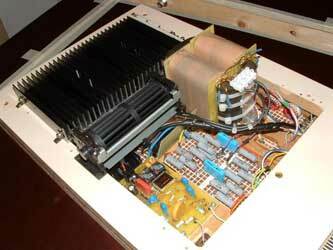 So the plans are to incorporate a direct drive high voltage amplifier. But for the time being transformer drive is chosen. I am not yet convinced that I direct drive amplifier with low enough power dissipation and high enough drive capabilities is achievable. The crossover filter between woofer and ESL should not degrade the sound quality. These are conflicting criteria, the lower the transition frequency, the larger the needed ESL. It doesn't look a good idea to me to put the transition frequency above 100Hz, so the target is 100Hz or lower. Taking into consideration the phase cancellation effect, you need a rather large ESL to have enough output at 100Hz, my prototype ESL (0.3m by 1.2 m) showed this. From this I concluded that though it is a hybrid system, the ESL would at least have 0.3m2 of radiating area. To have the lowest possible phase cancellation effect, so the easiest drive requirements (direct drive! ), the ESL width should be as large as possible. But on the other hand, all other acoustical laws point towards a long small transducer (line source). Integration of a dipole radiator in a room with sound reflecting walls is not easy, and very often overlooked. The rear radiation is as strong as the forward radiation, and as the most likely position for speakers is in two corners, they will be inevitably close to at least one reflecting surface. This leads to image radiators. Those are positioned, as looked from the listening position, close to the ESL itself, and are nearly as loud. This is explained in the text mentioned above with a lot of simple diagrams. It is clear that this leads to a confusing and blurred sound field. What is also explained in the text is the following thing. When the distance between the primary sound radiating source (the ESL itself) and the reflecting walls is made larger, there is a minimum distance above which the reflected sound from the images is no longer interpreted by the ear/brain system as confusing, but rather as normal room reflections. Above this critical distance, the delay between direct and the reflected sound is more then approx. 2 msec, and our hearing system does not have problems with interpretation of both sound-fields. This is also consistent with the psycho-acoustic information that I have found at other places, for example in Reference 5 . Sound waves travel approx. 0.7m in 2msec. (0.002sec x 343m/sec = 0.68m). Keep the distances between the radiator and reflecting surfaces, and between the listener and reflective surfaces at least greater then 0.7m. This guideline is of course not accurate, one should make sketches and do some trigonometry with angles etc., but in my opinion it is accurate enough.So the ESL needs to be at least 0.7m away from any sound-reflecting wall. But why do all the effort of building an excellent ESL pair, and place them afterwards in such a way that a lot of its quality is thrown away by a far from optimal placement. I have been thinking on this a long time without coming to an answer, and I think this dilemma has kept my construction plans for probably two years on the drawing table. On the other hand this time was not wasted, I did experiments and have build prototypes for the other parts, high voltage supply, crossover filters, transformers, subwoofer, amplifier. And then suddenly the golden idea was there. The house is rather old, was constructed in the 1920's, and has the typical ground floor construction of that time: two rooms behind each other, each approx. 5.5m long by 4.5m width, and a double door between. This door goes nearly from wall to wall and floor to ceiling (between A to B in the drawing). After removing that door (what was done when we moved in) you get a single rather large room, 11m by 4.5m and 2.7m high. Between the two rooms there are now two 50cm-wide walls (between those was the double door). Behind the listening position there is a third room, this room has approx. 4m depth (eating room, with kitchen besides it). In the indicated listening position there will be no reflections from behind in the critical 2msec time-span, as the back wall is 4 meter further to the right in the diagram. The idea is now to place the transducers in positions A and B, the front side faced to the listening position, and slightly aligned/tilted to create 'the sweet spot' there. (The 'classical' positions for speakers are indicated with crosses). The woofers are positioned on the floor, against the small walls, and will be approx. 33cm high. On top of them I will place the ESL panels, and those will extend from just above the woofer cabinets up to the height of the opening between the two rooms. This distance is approx. 2.3m. By giving the ESL panels the same width as the woofer cabinets (30cm) the radiating area will be sufficient for the required SPL. They will also be good line sources, as the radiating area will extend nearly from floor to ceiling. To make things more practical, I will hang the ESL panels in the wooden doorframe between the two rooms, as such a long and small panel is not very rigid, it would bend under its own weight. Acoustically this positioning is nearly an ideal one, as there are no walls in a position close to the ESL dipole radiators that could cause reflections within the critical 2msec timeframe. The 50cm-sidewalls between the two rooms are parallel to the ESL, and in this direction there is no emitted sound. The room sidewalls are at least 70cm from the ESL centrelines, so the reflected sound arrives at least 2msec later then the direct sound, and confusion is also avoided. The rear side emitted sound hits the rear wall at a distance of several meters. As conclusion: in this position there will be no reflections arriving at the sweet spot within the critical 2msec, and all reflected sounds will be interpreted as normal room reflections. In my opinion this must be a near ideal position for the ESL. The fact that one side of the ESL panel is close to the small separating sidewalls will also help a little against the phase cancellation effect. This sidewall will act as a baffle for the lower frequencies. But as I want to keep the dipole radiation for middle and higher frequencies I will leave an opening between ESL radiator and sidewall, so the ESL panel will not be placed directly against the sidewall. This gap will ensure dipole radiation for high frequencies, and in the same time cancel phase cancellation for very low frequencies. And what about the aesthetic integration in the room? Even here it looks like a very good solution. The presence of a 30cm small, thin, transparent object, even if it rises from floor to ceiling, in the positions just described, is not disturbing, especially if its colour is adapted to the room colours. What also helps is the fact that both front wall (towards the street) and back wall (towards the garden) are windows, so looking from both sides towards the ESL will show its transparency. On the other hand: smaller ESL speakers, 30cm wide and 1.5m high, placed in two corners would be much more disturbing and space consuming. And even if they were made transparent, they would not look transparent because there is a dark corner behind. Radiating area is approx. 22cm by 180cm, so radiating area is 0.396m2. 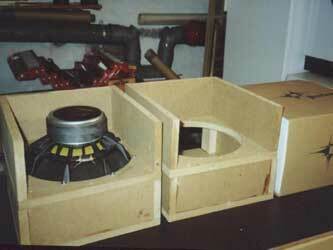 Dynamic dipole woofer: the enclosure should be (in one dimension) not more then 30cm. Then they can be placed underneath the ESL and do not protrude sideways. By placing the ESL drive electronics in the top part of the ESL frame, the radiating surface is placed more or less symmetrical between floor and ceiling. The woofer cabinet is not finished in these photographs; it is electrically and acoustically OK, but still needs some finishing. The electronics are incorporated in the grille-covered ovale shape at the backside top.Lets now turn to the detailed description of all parts. The ESL dimensions were fixed in the previous paragraph: stator width is 30cm; radiating area is 22cm wide and 180cm high. So radiating area is 0.396mÂ². The first question is then: what peak displacement is needed in such an ESL to get 100dBA at 100Hz? With the SPL spreadsheet (the same as was used in the beginning of the text) one can calculate that for 100dBA SPL at 100Hz a peak displacement of 0.7mm is needed. This value fixes also the minimum stator to membrane spacing. I will fix this at approx. 1.2mm, in order to have some safety margin. Phase cancellation starts at a frequency f1 depending on the smallest dimension of the stator. It starts when the smallest dimension is equal to the wavelength, but is in the beginning very gentle. At frequencies below fc the output drops at a rate of 6dB/oct. With D = 30cm the corner frequency fc is equal to 950Hz. Reference 8 in the paragraph 3.3.2 on Walkers equation (but also on several other positions in the text) states that for constant SPL at lower frequencies one needs to drive an ESL with constant current. In this way, without giving the phase cancellation effect an explicit name, this text describes here exactly what is needed to correct for phase cancellation. Because when lowering the drive frequency, if a constant current in a capacitor is wanted, one has to double the drive voltage for each halving of frequency. This is exactly the compensation needed to overcome the 6dB/oct loss caused by phase cancellation! Reference 3 does not mention at all the phase cancellation, despite the fact that quite heavy theoretical topics on acoustics are found in this book. Only on the pages 145 and 178/179 a little is said on equalization, without mentioning what has to be equalized. No general guidelines for equalization can be found, nor it is explained why equalization is needed. Reference 2 , does not mention at all the phase cancellation; in all the descriptions and measurements on electrostatic speakers that can be found in this book, nearly flat response curves are shown, no matter what width the ESL has, without speaking of equalization. The only explanation I can find is that curves are measured with a microphone in the near field, so close to the membrane that phase-cancellation does not show up. A microphone in the far field will definitely not measure such straight curves. Only at one position in the text, the phase-cancellation is mentioned: namely where the dipole dynamic woofer of a hybrid system is discussed. Very strange indeed that phase cancellation would only occur with dynamic driven dipoles, and not with electrostatic driven dipoles! Slope: +6dB/oct or doubling of the output voltage for each halving of frequency, below fc. Part of the compensation is done by placement in the room, with one side close to the side-walls (this wall acts as a baffle). So the correction filter will be adapted experimentally through acoustic measurements in the room. The electronic filter must be a first order shelving equalizer circuit. This can easily be implemented with one operational amplifier and a few discrete components around it. The circuit is described under ESL filter. I have at the moment not yet decided whether a very directive dipole transducer with a narrow '�sweet spot' has to be preferred above a dipole with a broader horizontal spreading. Both solutions seem to have advantages and disadvantages. Therefore the stator-wire construction will be worked out such that both versions are possible, only a few adaptations will be needed to switch from one to the other. So let us first determine what segments are needed to get a good horizontal dispersion and then divide the stator wires in segments to achieve this dispersion. Afterwards the segments can be joined together externally if a directive solution is preferred. Directivity can be expressed as for example: -3dB at an angle = +-15 degrees from the perpendicular, compared to the SPL at the perpendicular direction. For me this seems to be an acceptable value. Directivity follows acoustic laws, and can be computed; Reference 3, on pages 40 to 42 gives useful information that enables those calculations. This spreadsheet will only works in excel versions with the ' �analysis toolpak' � installed (it uses Bessel functions, and a standard excel install does not support this). Three values have to be filled in: the width of a specific segment / the max. frequency that is radiated by that segment / and the angle towards the perpendicular direction. The resulting attenuation in the chosen direction angle is readily calculated, so one can easily calculate by iteration the directivity of a given ESL segment. 5 kHz +/- 9 degrees -9dB! 10kHz +/- 4.5 degrees -18 dB! 15kHz +/- 3 degrees -26dB! In this way an acceptable dispersion for all frequencies is reached. The maximum frequencies that will be radiated by those three segments can be realized by insertion of series resistance's at the secondary side of the transformer. These resistances are calculated in next section. From now on I will fix the segmentation of the stator in this way. Before we can calculate the capacitance we need to define what wire is used, because the wire_ and insulation thickness play a role in the capacitance value. This wire is specified for use at max. 300Vac, the insulation withstands 2000Vac, according the mfr. data; I did not notice any breakdown in a short test up to 8kV at 20 degreesC. I did not test if for higher voltages, my tester was limited to this voltage. Now we can calculate the expected capacitance for each segment. I will calculate the capacitance between both stators, as the amplifier sees the impedance of this capacitance as load. In the paragraph on SPL calculation the value of the needed gap was determined as 0.7mm, and a more practical value of 1.2mm was chosen. My original idea was to have a gap as small as possible, in order to achieve a high efficiency, low drive voltages etc. With this choice I have encountered a major problem! After building two ESL panels with a 1.2mm gap, I noticed that it is not easy at all to achieve such small gaps in a large ESL (approx. 2m long). Both panels I have build suffered from the same problem: the high voltage could not be increased very much and the membrane collapsed into one of the stators. This was due to the fact that the 1.2mm gap was not very accurate everywhere. The maximum field-strength that I could have was only approximately 1200V/mm and efficiency was too low at this value. On the other hand, in smaller prototype panels that I have build I could easily reach over 2kV/mm with the same gap. There was only one solution possible, and it was a drastic one: I had to dismantle everything and increase the gap from 1.2mm to approx. 1.8mm. It is with this increased gap dimension that all following calculations/measurements are done. The capacitance values are calculated in Capacitance spreadsheet . I have also included the capacitance values measured on the ESL panel, measured after building two panels. The measured values are in agreement with the calculated ones, the measured high and mid segment values are somewhat higher (stray capacitance has to be added). From this the bandwidth of each segment is calculated. The stator wires are divided in cells, and those cells are electrically separated from each other, each cell has also one external connection. Afterwards those external connections can be joined together or separated, according to the way one wants to divide the panel in segments. Following Stator Wire spreadsheet computes some construction dimensions, like wire distance, transparency, total number of wires, total required wire length, position of nails at top and bottom relative to the stator center. It can also be used to lay out the way the external connections can be routed, grouped etcâ€¦ It has of course to be adapted for other stator dimensions. A last much larger cell, with 2x68mm width (the blue wire). To get the high-section I have connected cells 1 and 2 together (red and orange wires; total width=28mm). To get the mid-section I have connected cells 3 and 4 together (green and yellow wires; total width=28mm). To get the low-section I have connected cells 5, 6 and 7 together (grey, purple and blue wires; total width=164mm). This division is the one that was defined above in Directivity and Segmentation. Both stator halves are cut from a 18mm thick MDF plate, I bought 240cm by 30cm plates, and cut off 10cm to get the required 230by30cm dimensions.See also figure 1.2 for a sketch. With a top-milling machine five openings are cut out, each one has a height of 328mm and a width of 220mm. The distance between these openings is 40mm; between the top of the plate and the first opening there is 440mm, and between the last opening and the bottom of the plate there is 60mm. The back-plate has an extra opening in this 440mm high top part, the extra opening measures 330by220mm, and in this opening the electronics parts are build in. These electronic parts include: the driving amplifier without power supply (the power supply is integrated in the woofer cabinet), the step up transformer, the high voltage power supply, some control and protection circuits, and the secondary side series resistors. The vertical height of the openings in the MDF panel (328mm) is too large for the support of the thin wires, therefore I have added two horizontal stiffening bars per opening. Each crossbar is made from a thin wooden lath that is stiffened with a U-profile in aluminum slipped over the wooden lath. The aluminum profile is 10x10x10mm in cross-section, the wooden lath is milled to match exactly the opening in the U-profile. The crossbars are glued inside the MDF stator plate such that the backside is exactly parallel with the MDF backside. The stator wires can then be glued as well on the MDF plate as on the crossbars. Gluing the stator wires on the backside of the crossbars; this glue is as fluid as the PU glue, and sinks easily between the wires, and flows between the wire and the crossbar. As it is transparent a small quantity that would spill on to the edge of the crossbar is not visible from the front. The dark PU glue could be used here too, but would be too readily visible from the front. Gluing the diaphragm to the spacers on the front stator part. The back stator part is not glued to the diaphragm, but pressed to it with a lot of screws during the final assembly of the stator; by doing so it is always possible to dismantle without destroying the fragile diaphragm. view on the stator wire attachment; some of the nails are covered with epoxy. The following drawing shows a detail of the stretching table. On the 2 long sides there are wooden strips that can be pulled outwards by turning 4 bolts on each side. . By turning the bolts the lat A is being pulled outwards, and the diaphragm is stretched. This stretching table is made quite strong, with heavy wooden parts. This is a real necessity, as the force when stretching such a large film is really large. A sheet of Mylar film that measures approximately 85cm by 210cm is placed on it and fixed along one of its long sides with self adhesive tape to the table. Then it is manually stretched until most wrinkles have disappeared and fixed to the other side of the table. Then the stretching in the long direction is done manually; the Mylar can also be fixed to the table there. After this operation nearly all wrinkles should be gone. After this the bolts are turned one after the other until the Mylar is a perfect mirror, without any wrinkles in it. Only then I place some markers on the Mylar at accurately measured positions, for example at 60cm distance. Then the real stretching begins. The bolts are turned one after the other, and the distance between the markers is checked regularly. I have tensioned until the 60cm distance had increased to something in-between 61.2 and 61.5cm. This means a stretching between 2 and 2.5%. At that stretching I have the impression that I am very close to the point where the Mylar will tear up, mostly this happens in the corners. The corners are best protected against this tearing up by sticking some tape on the Mylar there. This sheet of Mylar is large enough for two ESL panels placed alongside each other. This is what I did first, because I wanted the same tension in both. But the two ESL that came out did not perform well, as indicated before in the paragraph ongap dimension. There I mentioned that the membrane was not stable enough (gaps too small / tension not high enough). I think the tension in the Mylar on the stretching table is probably high enough in the middle part of the sheet, but probably lower at some of its outer areas. This is a guess, but anyhow, when remaking the ESL's I placed only one stator in the middle on the stretched sheet, and used a second sheet for the second ESL, and the result was in both cases OK in the first try. So my suggestion here is: make the dimensions of the stretched sheet considerably larger then the stator dimensions. The type of coating I used is provided by Jonas Karud. This coating is easy to apply, the surface resistance can easily be adapted by diluting into water, and it has the advantage that the sensitivity to humidity is quite low. I applied a 1 to 7 diluting, to get a surface resistance around 1000megohms/square; this was verified by measurements afterwards. The measured value lies between 700 and 1500megohms. See also on yahoo ESL club documentation for some details on experiments I did with other coatings ( Coating.pdf - text in Dutch only). My first intention was to support the diaphragm only at the edges, so nothing in some middle positions. This in order to position the fundamental resonance as low as possible. This resonance turned out to be somewhere in-between 35 and 40Hz. This turned out to be a mistake. It was not possible to increase the high voltage above approximately 1300V or the diaphragm became unstable. This was partly due to the too large unsupported area, and partly to the fact that the gap was not uniform enough (the smaller the gap, the larger the relative tolerances are); and maybe also due to the loosening of some strength in the diaphragm. Build in two foam support strips between stator ribs and the diaphragm. The position is indicated in by the RED parts of the two crossbars in Fig 1.2. These are of course not visible in a finished ESL, but I have drawn these parts in red to indicate the position. By choosing these positions, the diaphragm is divided in three equal parts. The result of this seems to be OK. And to my surprise the fundamental resonance did not shift very much (close to 45Hz now). Also the sensitivity increased; for the larger gap I need more drive voltage, this lowers the sensitivity, but the higher possible high voltage increases it more. So the net result is a gain in sensitivity! All components outside the blocks in this diagram are not mounted on a PCB but rather somewhere on the MDF stator plate. There are two cables coming from the woofer cabinet. The first one is the supply cable; it contains 4 wires, the ground connection, +48V, -48V and the ON-signal. The second cable is a coax cable that carries the audio signal. The power ground cable is a 4mm2 cable, in order to get a very low-impedance connection to the ground of the power supply in the woofer cabinet. The +48V and -48V lines are 1.5mm2 cables. The ON-signal is switched to high (+12V) when the system is switched on. It is used for switching on the relay at the amplifier output, with 2sec delay at switch on and no delay at switch off. The filter with inductors and electrolytic capacitors at the power supply input is very important. The supply lines of a class-B amplifier carry high frequency harmonics with high values of the audio signal. This filter ensures that those high frequency components do not flow in the cable between ESL and woofer, but flow between amplifier board and capacitor C1 to C4 (very close connection). Without filter they would flow in the cable and by induction generate distortion components in the coax cable (both cables run for some distance in parallel). A good explanation of this can be found at the excellent web site of Douglas Self, see Reference 10, the articles on '�Distortion in power amplifiers'�. More explanation on each of the blocks can be found further. A dc/dc linear regulator to make a +15V stable supply voltage, used on this module and also in the high voltage generator. Circuit around Q1 and I1. A temperature sensor circuit to measure the temperature on the power amplifier heat sink. A diode is glued on top of one of the output transistors in the Leach amplifier. It is connected with two wires to the TEMP SENSE lines. At +65 degreesC on the diode, a small fan for cooling the heat sink is switched on, and an orange color indication LED is on also. The fan is a small 3.5W tangential fan, placed close to the heat sink. It generates very low acoustic noise. But even with very loud music I have never seen it turn on; on the other hand when testing the system with sine waves and enough volume, after some time it turns on. 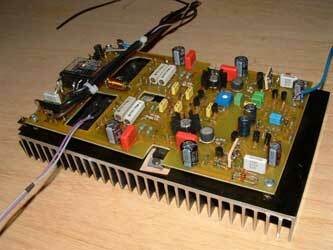 This board is mounted vertically along one of the short sides of the amplifier heat sink. The high voltage generator is made around a small step up transformer that is mostly used in power supplies for cold cathode fluorescent tubes for backlights in laptops. The type used has a step up of 1:67 and a maximum allowable primary voltage of 20V. The printed circuit board measures 100 by 52mm, to make it that small part of the components are surface mount components. With trimmer P80 the output voltage can be adjusted. The output voltage can be measured on capacitor C82. The relation is: Output voltage = 640 x dc voltage on C82. The circuit oscillates at 65kHz, and as the circuit operates in resonant mode (only sine voltages present), it generates very low radiation. It also starts oscillating with an input voltage as low as 1.5V on C82. In my ESL I adjust the voltage on C82 on 6.5V, this gives 4160V on the output, or approximately 1900V/m in the gap (electrical gap is 2.2mm). I have noticed that when rising the value of the high voltage, the SPL increases substantially for field strengths up to 1500V/m, and above that the slope is much shallower. The circuit has low enough output impedance: with 5�A output current, the voltage drops less then 100V. The output transistors: I use the Motorola MJL3281A/MJL1302A pair. These have better gain linearity in a wide range of collector current then the transistors from the original Leach, and have a better matching. This leads to lower harmonic distortion. The 4 diodes used in the quiescent current stabilizing circuit: I use Motorola MURS160surface mount diodes, because those surface mount diode packages have a flat insulated surface, and can be very easily glued to the heat sink. The complex mounting of round body diodes in holes in the heat sink is as such avoided. In the original Leach amplifier it is necessary to adjust two resistor values depending on the value of the supply voltage, resistors R13 and R14. But the supply voltage is often varying depending on the current drawn (a few volts drop at 10A output current is not unusual). On the other hand, those resistors set the quiescent current in the input cascode differential pair, which is a rather important setting regarding distortion figures of the amplifier. In my set-up with rather long leads between power supply in the woofer cabinet and amplifier in the ESL panel, I decided to improve this by modifying the circuit. The resistors are each replaced by a small circuit with one transistor. This circuit forms a small current source, independent of the supply voltages on the +/-48V lines, the collector currents of these transistors stay fairly equal to 8mA, the optimal value indicated by Leach. At the output I have added a series relay (16A type). It is switched on with 2sec delay when the input signal '�ON'� goes high, and switched off with nearly zero delay when the input line goes low. The following is similar to the original Leach amplifier, but I want to mention it explicitly as it is a very important thing, especially in my set-up with long lines between power supply and amplifier. The resistor between the two ground lines: it connects the (input signal ground with the power ground. With a direct connection between the two grounds there would inevitably flow a large part of the output current through the ground connection of the input coax cable. This leads to higher distortion, this is explained very well in Reference 10, the articles '�Distortion in power amplifiers'�. I developed and wound the transformers myself, in order to get a well adapted match between amplifier and ESL, and also because the available transformers are or very expensive, or have mostly one or more inherent problems (very low impedance at high frequencies, or saturation problems at low frequencies). The core used is a staple of three C-cores. This in order to get a high cross-section; this is needed in order to reduce the number of turns to acceptable values. The maximum secondary drive voltages are: 33Vrms x 75 = 2475Vrms on each secondary, or 7000Vpp between both stators. Impedance at the primary: Unloaded for 1:75:75: above 1.5 ohms over the audio bandwidth (100Hz-20khz). Unloaded for 1:50:50: above 2.3 ohms over the audio bandwidth (100Hz-20khz). Self-resonance is above 40kHz; more details in the paragraph measurements Loaded: see further in the paragraph measurements. The parasitic resonance between the leakage inductance and internal capacitance, reflected to the primary is at 43kHz. 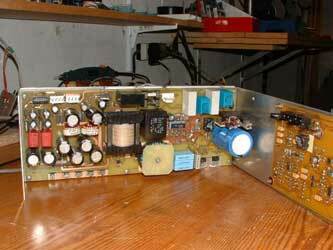 This is well above the required bandwidth, so this transformer is without any parasitic resonances in the complete audio bandwidth. 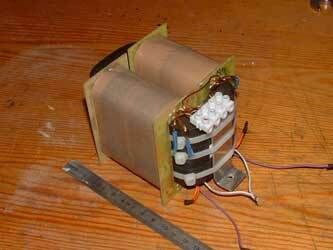 If anyone is interested in more detailed information on making these transformers please contact The Audio Circuit. Your requests will be forwarded to Marc Schroeyers. The resistors used are 5W wire wound resistors. In each secondary there are at least 6 resistors in series in order to reduce the voltage stress on a single resistor. The capacitors used are FKP type film capacitors. I use 4 capacitors of 4 times the required value in series; each one is rated at 2kVrms, because I had those available. But 3 of those each one 3 times the value would be OK also. This is because the full stator-to-stator secondary voltage may be present on those capacitors. 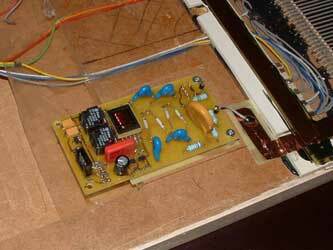 (The photograph shows not the final version, but a first version in where I used only one capacitor). A lot of the information in this part is coming from and inspired by dipole woofers designed by S. Linkwitz. It is my opinion that an ESL and a dipole dynamic woofer can be best mates if certain precautions in the design and construction of the woofer are taken. Why do I prefer a dipole construction of the woofer? The acoustic radiation pattern is similar to an ESL. With a dipole radiator the number of room resonances that are excited is much less then with any other loudspeaker cabinet type. This is important for the woofer, as especially at low frequencies (below a few hundred Hz) discrete room resonances are generated. Above this frequency range the number of reflections is so high that they melt together and are interpreted as room reverberation. Therefore the use of a dipole woofer leads to a less pronounced, but much more natural bass sound. This advantage alone is for me a sufficient reason to choose for this type of radiator. A bass reflex and a band-pass type cabinet use the fundamental resonance of the loudspeaker to boost the acoustic output at those frequencies where it would normally drop. But using a resonance for this leads to a far from optimal transient response, as a resonant system is per definition not following the input signal any more, it is just excited by the frequency of the signal and looses control when it comes to amplitude and phase. A sealed box drives the fundamental frequency of the driver up, especially when it is made small. So you need a large enclosure (and special drivers) to keep it as low as for example 20Hz. If well damped, the transient response can be quite good, but it is a 360 degrees radiator at low frequencies, so a lot of room modes will be excited. Similar drawback are found in transmission line enclosures: large, and no dipole radiation. The fundamental resonance of the build-in driver is even a bit lower then for the same driver in free air. The cabinet can be very small, in my case it is in fact not much larger then the cardboard box in which the driver is sold! See woofer enclosure, where two open enclosures can be seen together with the box in which the driver is packaged. An open dipole cabinet or a flat baffle suffers from phase cancellation, similar to the ESL itself. This means that the output drops with 6dB/oct when frequency lowers. As the frequency range in which the woofer will be used is limited to approx. 20 to 80Hz, this means that the signal drive at 20Hz must be 4 times more then at 80Hz. This can be solved in a quite simple way with a first order active filter. The driver must move a lot of air at the very low frequencies. You can compare the open baffle with an air pump, a lot of air has to be pumped between front and back in order to create enough sound pressure; There are high air velocities in the baffle openings, but as our ears are not sensitive to air velocity, this is not a problem (of course as long as there are no turbulences created). Phase cancellation is at the origin of this. So the driver must be chosen with air displacement in mind. Those drivers are rather expensive if one goes for high quality/low distortion. 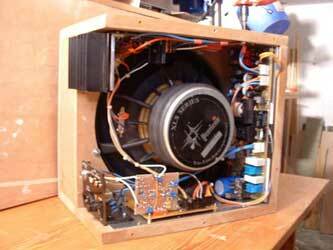 It is not true that a dipole woofer needs a very powerful amplifier. At the very low frequencies the power for driving it towards the peak cone displacement is quite low, because the driver is here close to the resonance frequency, the impedance here is mostly much higher then the 4 or 8ohm (see manufacturers datasheet), and hence the absorbed power must be low. The drivers I have chosen need only around 15W here, for full rated output. (The fact that they are in resonance is not a problem, as the extremely low output impedance of the amplifier very well damps this resonance). At higher frequencies the drive is much less; in fact with the correction filter, the drive is inversely proportional to frequency. So also here the needed power is much less then the rated power of the driver as specified by the manufacturer. My subwoofers can be driven with a 80W amplifier to get an output that matches the accompanying ESL. And above this, I consider a high power output for an amplifier these days not at all a problem, especially not for those who are familiar enough with electronics to build one. This choice was influenced mainly by the document alternate woofer choice, on the Linkwitz website. The detailed distortion measurements in this document convinced me, as I had never seen such detailed and precise information on distortion in a bass loudspeaker. Before seeing this I thought about incorporating motional feedback in the dipole woofer, to reduce distortion, but with a so low distortion for the driver alone, I do not see the advantage any more. Because one must not forget that motional feedback is a beautiful thing in theory, but to build it and keep it stable, and to measure how far the distortion is reduced, is not easy at all. And after all I do not have the instruments to measure these things, so I prefer to rely on a serious professional who has the instrumentation and the skills to use them, and who is so good to let us all now his findings. The dipole woofers that are designed by S. Linkwitz inspired me for the cabinet construction; but in contrast with the designs of Linkwitz, I have chosen to use only one driver per channel, mainly because of the cost and the needed volume to incorporate two drivers. The disadvantage is of course 3dB less SPL. But considering you only loose 3dB and end up with half the cost and half the volume, I thought this was a good compromise. Also the fact that in this system the woofer output must match the not-extremely-high output of an ESL made me make this choice. The overall envelope is 35cm high, 35cm deep, and 30cm wide. This is very small, in fact this enclosure is marginally larger then the cardboard box in which you buy the driver. In this small box, I intend also to incorporate a lot of electronics, namely the 120W subwoofer power amplifier, the crossover filter, protection circuits, automatic switch-on activated by the audio signal and switching power supply. This power supply is rated at 250W continuous and 450W peak output, so it has enough power at hand to supply not only this woofer amplifier, but also the amplifier to drive the ESL (this amplifier is integrated inside the ESL panel). For the details about these electronics, see Subwoofer Electronics. The box is placed such that the smallest dimension (30cm) is the width, as a result the woofer enclosure has exactly the same width as the ESL, and both integrate very well, the ESL panel on top of the other. Positioned as such, the driver is mounted sidewards inside. There are 3 modules in the subwoofer enclosure: the power supply module, the amplifier module and the input/filter/protections - module. These are positioned as seen on woofer enclosure with electronics: the cover is removed; the amplifier is on the topside in the photograph, behind the heatsink. The power supply is on the right side, and the input/filter module is on the bottom side. The backside opening is between the heatsink and the plate with connectors. The electrical block diagram can be found in: block diagram woofer electronics. All components outside the blocks in this diagram are not mounted on a PCB but rather somewhere on one of the enclosure sides. Part of the back opening is filled with the amplifier heatsink, and part with the input and output connector plate. This plate contains also an on/off switch, a fuse and the mains cable plug. More explanation on each of the blocks can be found further. The switched outputs are switched on as soon as an audio signal is arriving at the BNC audio input connector; when there is no signal present during approximately 5 minutes the supply is switched off again. See further in the CONTROL MODULE. This board can be seen on supply and control module. The photograph shows also the input/control module at the right side. In the enclosure the power supply is mounted vertically along the front topside of the woofer enclosure. The efficiency is very high: I measured 94% at full output power. A very high efficiency is needed because inside the woofer enclosure there is very little cooling available. The aluminum baseplate, when laying flat down on a table surface with the PCB above it, has a delta-temp of approx. 20Â°C above ambient, and this is not a good position at all to get the heat away. Transformer and inductor have similar small temperature risings. Switching noise is very low, and quite easy to remove at the outputs with small low-pass filters. The switching frequency is above 150kHz. The output transistors: I use the Motorola MJL3281A/MJL1302A pair. These have better gain linearity in a wide range of collector current then the transistors from the original Leach, and have a better matching. Both lead to lower harmonic distortion. At the output I have added a series relay (16A type). This was described in the block-diagram part. The automatic switch on circuit. As soon as an audio signal is present on the line SIGNAL_IN the line ON goes high (+12V). the signal ON is also connected to the ESL amplifier output relay (see description of ESL drive electronics). The output of the woofer amplifier is sensed: as soon as a dc level is present here the relay is switched off to protect the expensive woofer. at +65 degrees C, a fan is switched on. the fan is a small 2.5W fan, placed close to the heat sink. It generates very low acoustic noise. But even with very loud music I have never seen it turn on. at +85 degrees C a red color indication LED is turned on, and the woofer relay is switched off. This board can be seen on supply and control module at the right side of the photograph. This small but very important module is plugged in on connectors J3 on the input/control PCB. The routing of the audio signal is such that it never enters one of the other boards, and there are no connectors in the signal path, all connections are soldered. There is a short coax cable between input plug and the filter board. On the filter board the signal is split into low (for the woofer) and high (for the ESL) signals. The low signal is connected with the low amplifier with a soldered coax cable; the high signal is connected with the output plug (to the ESL) with another short coax cable. This filter must be at least 2 degrees order low pass at 100Hz crossover. This is because of two reasons: first the woofer's frequency response is not extending far enough, as it is a rather large woofer. And second the enclosure shows a resonant peak at all harmonics of the frequency where the distance measured between front and back opening is equal to half a wavelength. The measured first resonance frequency is around 250Hz. With a first order filter at 100Hz, the attenuation at 250Hz and 500Hz is not enough, there will be an audible peaks at these frequencies. With a second order filter, the problem still persists at 250Hz, but at 500Hz and higher the attenuation is high enough such that the small resonant peaks will not be audible any more. With incorporation of an extra notch filter at 250Hz also the peak at 250Hz can be suppressed. See Linkwitz dipole woofer equalisation for more details about this. We need a filter that has a slope of +6dB/octave when lowering the frequency, and this in the region 100Hz down to 20Hz, to cancel the dipole effect of the enclosure. When used with step-up transformers I would choose for a 2 degrees order filter. The higher slope of this results in more attenuation at the frequency where the transformer goes into saturation, or, looking at it the way around: with a higher slope filter you can use a smaller transformer (and as a result, a better high frequency response is then possible), because the saturation frequency can be placed closer to the crossover frequency. When used with a direct drive high voltage amplifier, there is no need for high slopes, except one: the fundamental resonance of the ESL. If this is not well damped, the signal amplitudes here should be much smaller then the signal amplitudes at the crossover frequency. As both frequencies are close together (100Hz and I expect a resonance around 45 or 55Hz), there are two choices: or provide good damping, or use a higher slope filter, eventually combined with a notch filter on the resonance frequency. I have chosen for the last option. The filter will be a 2 degrees order high-pass at 100Hz crossover that matches the woofer low-pass filter. An extra notch filter at 45Hz (-17dB) suppresses the signals around the resonance frequency of the membrane. We need a filter that has a slope of +6dB/octave when lowering the frequency, and this in the region 900Hz down to 100Hz, to cancel the phase cancellation. An extra remark here on the use of the notch filters. Many do not like at all to incorporate filters in audio chains, and prefer a direct link with no extra components at all. In my opinion they do forget one thing: in that case the transducers are driven sometimes heavily at frequencies where they do have problems: the ESL at the fundamental resonance and at the saturation limit of the step up transformer, and the woofer at frequencies where the cone breaks up etc. It is better to avoid driving them in those regions. And secondly: when an ESL for example has a resonance peak in the low frequency region this means also that there will be a very bad pulse or transient response. After adding a filter with the inverse amplitude response as the ESL itself has, the overall response is flattened, and the transient response will be improved! It is the overall response that matters, not the response of a part of the chain. Therefore I am convinced that adding the above-mentioned filters improves the total response instead of ruining it. An extra argument is that the notch filters are both situated in a frequency region outside of the pass-band, at a frequency where the response is already a certain number of dB down compared to the average level. Opamp I1 (output-7) is an input buffer, to get a low impedance to drive the crossover filter. Opamp I2 is the crossover filter, a Linkwitz-riley filter of the second order. The crossover frequency is 100Hz. Both outputs are -3dB down at the crossover-frequency. Output LOW_PASS is connected to opamp I4 (output-pin7). This is the filter that has a slope of +6dB/octave when lowering the frequency, and this in the region 100Hz down to 20Hz, to cancel the dipole effect of the enclosure. Opamp I4 (output-pin1) is the notch filter at 240Hz. The notch is 17dB deep, and suppresses very well the first peak in the stop-band of the dipole cabinet. At the output-connector J4 to the woofer power amplifier is an extra high-pass filter with a corner-frequency at 10Hz. Output HIGH_PASS is connected to opamp I3 (output-pin1). This is the filter that has a slope of +6dB/octave when lowering the frequency, and this in the region 600Hz down to 100Hz, to cancel the dipole effect of the ESL (phase cancellation). Opamp I3 (output-pin1) is the notch filter at 35Hz. The notch is 20dB deep, and suppresses very well the fundamental resonance of the membrane. This notch filter has a response that is the inverse of the resonance peak of the ESL. By incorporating it, I am able to use the ESL without any damping cloth; as a result they are and look very transparent. This paragraph is under construction. Or Hobbybox-4 with the same microphone. The self-resonant frequency is a little above 40kHz, so way above the audio bandwidth. The saturation limit is 33Vrms @ 67Hz (this is ok for a - �275W / 4ohm - � amplifier), or for a - �100W / 4ohm - � amplifier full drive is possible down to 40Hz. The low frequency bandwidth is of course much lower (approx. 5Hz). For high frequencies the actual impedance is higher then the impedance of the ESL alone: this comes from the fact that only part of the full secondary voltages is present on the ESL itself. This is caused by the leakage inductance and the ESL output filter. So it is partly a result of the filtering that was incorporated in order to get a flat amplitude response. Also for low frequencies the actual impedance is higher then the impedance of the ESL alone; this is caused by the resonance between primary inductance and sum of all capacitances. This is of course not at all a problem, because the voltage transfer is what matters, and this voltage transfer is constant over this frequency range. Below 100Hz the impedance lowers, this is simply the impedance of the inductance of the primary winding (equal to 2 x pi x F x Lp). The overall result is that the combination of ESL + transformer shows impedance above 2ohms for frequencies below 10kHz, and stays above 1.5 ohm between 10kHz and 40khz. There is no sharp resonance present that would drive the impedance well below 1ohm. The leach amplifier will have no problem in driving this load. Response woofer alone in room Measured at a distance of 3 to 4m, in the listening position. This curve is the result of averaging the response curves of 5 identical measurements, each one is performed at a different position in the room, but all positions are in the area of the- �sweet spot - �. I did this because I noticed that varying the microphone position over a slight distance (for example half a meter closer tot the speakers) leads to different peaks and valleys in the response curve. So I assume these are room artefacts, and not due to the speaker response itself. By averaging some curves, the room influence on the measurement is minimized. The curve shows clearly that the woofer reproduces only the frequency range below approx. 100Hz. The inevitable room resonances (or standing waves) are visible in the range below 300Hz. It is not clear to me wether the peak between 200 and 250Hz is a room resonance, the remaining first peak of the dipole cabinet, or a combination of the two. The bandwidth of the dipole cabinet extends below 30Hz, the fact that the level drops between 20 and 30Hz is due to a room resonance; because measured at another position in the room distant enough from the first one, it is possible to get the position of the peaks and valleys at other frequencies (for example a peak at 20Hz, a valley at 30Hz). Response ESL alone in room Measured at a distance of 4m, in the listening position. A similar remark on the averaging as mentioned above applies. The curve shows clearly that the ESL reproduces only the frequency range above approx. 100Hz. Below 100Hz, the slope is first approximately second order (20dB/decade); then it goes to an higher order, but the level is boosted again by probably a room mode. The inevitable room resonances (or standing waves) are visible in the range below 400Hz. Those peaks and valleys, and also those in the higher frequency range, shift to other positions when placing the measurement microphone in other room locations. The fundamental resonance is not visible at all; the notch filter in the crossover circuit suppresses it. So I do not use any damping with a cloth or so, this in order to get a real transparent ESL. The bandwidth extends to 20kHz; it is limited to this with the series resistors in the ESL output filter. Response ESL + WFR in room Measured at a distance of 4m, in the listening position, and a similar remark on the averaging as mentioned above applies. The curve shows a nearly flat response, from 20Hz to 20khz. I also had the opportunity to use for one weekend a professional hand-carried measurement microphone with real time third octave display of the amplitude response. The (although) low-resolution graph on this display confirmed the response shown here, even with a little less drop in the region between 15 and 20kHz. There was a gentle -3dB dip visible between 100 and 250Hz (not enough correction for the phase cancellation? ); I do not understand why this is not visible in the Hobbybox measurement, but of course the microphone I used here is not calibrated one. The impulse response is also measured with hobby-box. Measured at a distance of 4m, in the listening position, and a similar remark on the averaging as mentioned above applies. See impulse response for the result; the horizontal axis is in msec. For a comparison with responses of some quality speakers look at impulse response of some loudspeakers. Between the time interval 3.5msec to 4.5msec after the rising edge of the pulse, there is a low frequency ripple; the period seems to be 1.5 to 2msec, so the corresponding frequency is between 500 and 670Hz. Around 400Âµsec after the rising edge of the pulse, there is a slight disturbance. But it has no real high frequency content (no sharp edges). The Quad ESL63 response shows similar disturbances, and even with sharper edges. 7.6 How does it sound? I am not going to write a lot of things on the sound, because I think that these matters are very subjective. The most heard remark from the people that hear this system for the first time is: it has a very open and clear sound. Is it a transparent sound? I am not going to pretend that, transparency is a subjective impression, I am not aware of an instrument that measures it, so it is very difficult or impossible to compare with other systems. But on the other hand, it is my opinion that the most important matters that are needed for quality reproduction can be measured. Impulse or step response is very important, amplitude response also but probably to a lesser content. I have done those measurements and the results are for me satisfactory. I am not going to modify anything in order to get a more pleasant sound, as I am convinced that our hearing system is very subjective, and is not a measuring instrument. It can of course detect subtle distortions, which can otherwise only be revealed with expensive instruments that I do not have. I have not noticed anything yet that would suggest that there is audible distortion present. I am pleased with the room-integration and the esthetic transparency of the speakers (even my wife is more enthusiastic then I am myself, and before this project her vision was that loudspeakers should not be visible at all!). I am also pleased with the results of amplitude and step response; it is remarkable that it is possible to get better results then some studio speakers with a completely self-build system. I am pleased with the overall sound and with the precise sound field: in the listening area the location of the individual instruments, vocals in a complete sound field is really convincing. This is a segmented ESL in order to get a large enough listening position. A non-segmented ESL would probably have a little more detailed sound field, but I am at moment pleased with the result I have got. I think that the room placement with avoidance of reflections within the 30msec critical timeframe helps also a lot for this. The maximum volume is enough for a living room, but it is nevertheless clear that this system is at its limits there. So this is good enough, but it is again evident that an electrostatic loudspeaker is limited in SPL compared to other sound reproduction technologies. I have measured a maximum SPL level of approximately 90dB on white noise. I have learned a lot when doing this project, and I wish to thank the authors of all the literature mentioned in the references, and the numerous members of especially the Dutch Yahoo group on Electrostatic Loudspeakers for the interesting remarks, discussions, contributions etcâ€¦ Without all this I would have not been able to finish this project with success. Ref 2 E. FIKIER, 'Electrostatische Luidsprekers', zelf bouwen of zelf kopen. Uitgeversmaatschappij Elektuur BV, Postbus 75 - 6190 AB Beek Limburg. Ref 9 J.H. Streng, 'Charge movements on the stretched membrane in a circular electrostatic push-pull loudspeaker' / 'Sound radiation from a vibrating membrane' / 'Sound radiation from circular stretched membranes in free space' / 'Calculation of the surface pressure on a vibrating circular membrane in free space'. Philips Research Laboratories, Eindhoven. Ref 10 Douglas Self website, the power amplifier institute.